Checklist for Evaluation of (CIA) Software Providers: Two distinct – and possibly conflicting – motivations overshadow the discussion on customer identification authentication (CIA). Leslie Ament, (https://www.linkedin.com/profile/public-profile-settings?trk=prof-edit-edit-public_profile) SVP of research and principal analyst shared, ”We found that several vendors are taking a multi-modal or multifactor authentication approach to CIA beyond voice biometrics (http://#_ftn1), in which case we recommend there should be assiduous back-end integration. In short, companies should think about cross-organizational design and encompass numerous issues, from integration of authentication methods to application integration." -- Measure productivity and effectiveness of CIA initiatives and how often? -- Prioritize software selection criteria? -- Prioritize specific CIA initiatives? -- What percent of company revenues are committed to CIA, and when ROI is expected? Respondents operate primarily in Europe (41.5%) with healthy representation from Asia Pacific (32.4%), and North America (26.1%) regions. Among the 664 respondents, the organizations were divided among SMBs (8%) with revenues under $100 million, mid-market (34.6%) and large enterprises (57.5%) with $2 billion or more in revenues. 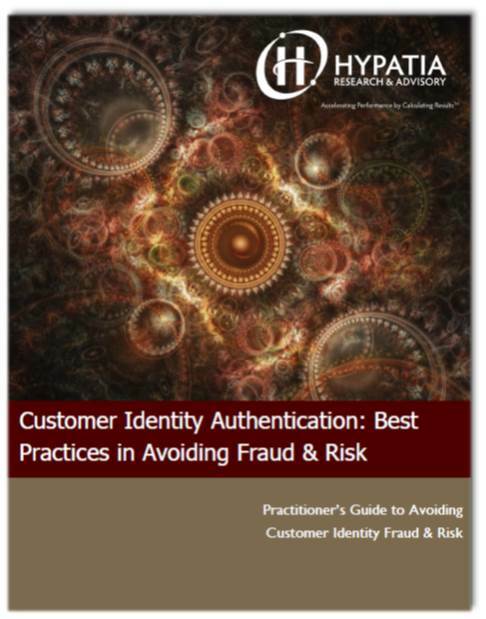 More demographic information at: Customer Identity Authentication: A Practitioner’s Guide to Best Practices in Avoiding Identity Theft, Fraud & Risk (http://hypatiaresearch.com/product/customer-identity-auth...). Industry analyst and market research firm Hypatia Research Group (http://store.hypatiaresearch.com/customerdatamanagementhowleadersrealizetangibleroi.aspx) delivers high impact market intelligence, industry benchmarking, best practice, maturity model and vendor selection research for how businesses use software technology, professional services and management consulting providers to capture, manage, analyze and apply customer and market intelligence to enhance corporate performance and to accelerate growth. Coverage includes: Customer Management (CRM), Business Intelligence, Advanced Analytics, Customer Analytics, Social Media, Text Analytics, Digital Marketing, Information Management, Customer Data Management/Data Quality and GRC. Since 2001, clients have relied on Hypatia for industry insight, expertise and independent market research for guidance in assessing various technology and service options. For advisory, licensing (http://hypatiaresearch.com/product/customer-identity-authentication-best-practices-in-avoiding-identity-theft-fraud-risk/) or further analysis on this topic by company size, industry, job function or geography, please contact Research@HypatiaResearch.com or call 781-862-5106.